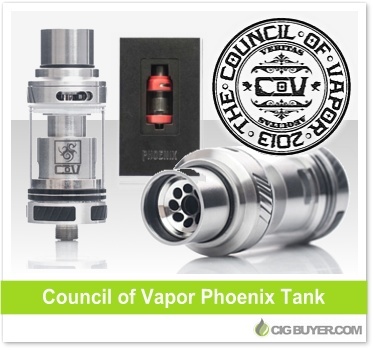 The Council of Vapor Phoenix Tank is a new breed of ceramic tank where a permanent ceramic wick is cleaned, rather than replaced. Unlike the COV Defiant Tank which uses replaceable ceramic coils, the coil in the Phoenix (0.5 ohm) is said to last for months and is designed to run between 60W and 120W. It features a locking, twist off top-fill system with dual top adjustable airflow and holds 2ml of e-juice. It comes with three (anti-spitback) honeycomb drip tips and red silicone bands for heat shielding.